﻿ Thank You for the Honor! than the month of November to also give thanks for our customers? to the survey period of June 2016.
management, and individualized disease health coaching. stores. By contrast, we take the time to care for you and your family right in your community. Trusted advice. 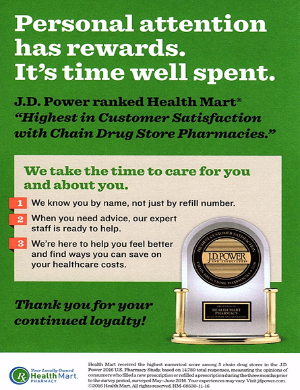 Patients can trust the advice offered at their local Health Mart pharmacy. help you achieve optimal results from your medications. Customer loyalty. Personalized service plus trusted advice is clearly a winning combination. industry average in customer loyalty. pharmacies are a part of the community—close to where our patients work, shop, and live.